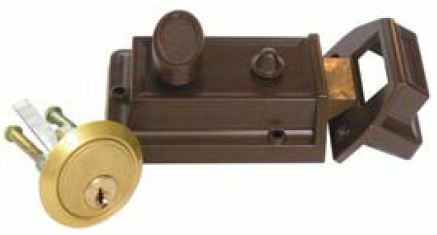 A small button control on a nightlatch that can hold the latchbolt open or override the spring loading and turn the latch action off making the latchbolt in effect a deadbolt. 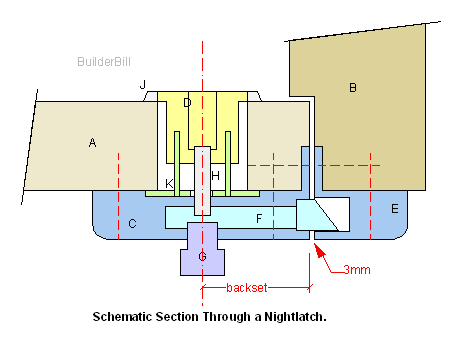 Nightlatches are a type of small and specialised rim lock that are used in their millions around the world where cast effective and basic security is need. They are not intended to be the ultimate and uncrackable lock. They fix to the face of the door and the strike or receiver fits to the face of the door jamb. Unlike the older type of rim locks that can be fitted with different types of furniture with these latches what you see in the packet is what you get. There is no need for handle options as these latches are extra additions to the main door lock and furniture. They are designed for their intended use which is to be locked when the building empty and then opened and left open while the building is occupied during the day and then in residential situations they are locked at night , thus getting the name night latch. All these latches can be used on left or right hand doors by simply turning them the other way. Just be aware that the cylinder hole is not exactly in the centre so if you want to keep all the locks exactly the same height then the holes will have to be slightly different, left to right. Again the lock can be opened and the bolt reversed to suit opening out doors or opening in doors. the one above had the latchbolt set for a door that open outwards. The lock below is set for a door that is opening inwards. Image provided by Hayfield Australia Sty. Ltd. Here is a budget style lock that has a feature which I like. The fact that the strike plate has a return into the jamb so that extra screw fixing can be used. Obviously it is a little harder to fix but I think the extra fixing is worth it. This type of lock has a snub. The small button to the right of the knob. This is used at night-time to lock the latch firmly. (Think about not being able to open it with a credit card). A and B are the door and the jamb respectively. C and E are the body of the latch and the strike or receiver. D and J are the separate cylinder and it's escutcheon plate which fits in and over the hole. K is a backing plate and it's screws (green) that mounts the cylinder to the door. This means that the cylinder is separate from the lock fixing wise. G is the knob which also connects with F.
The backset is the distance from the edge of the lock/door to the centre line of the cylinder hole. The red dotted lines are fixing screws. So look at the lock and the instruction sheet. Don't assume it is the same as the last one that you fixed as they do differ from maker to maker. The old saying "Measure twice and cut once" is never truer than when cutting these fiddly connections from lock bodies to cylinders.